Just enter your round or square optic's dimensions to quickly find the best packaging in the industry for your high value lenses, filters, gratings, mirrors and other optical elements. By never contacting the sensitive optical surfaces, these precision-made PET-G containers eliminate packaging-generated defects, and ensure that your components come out of the package just as perfectly as you put them in. Because of its superior outgassing characteristics and clean room compatibility, Safe-Guard packaging containers and trays are made exclusively from NASA tested and Eastman Chemical developed, PET-G. Available in several convenient sizes, many with optional lids, PET-G optics handling trays allow you to extend your commitment to quality to every phase of your manufacturing, finishing and fulfillment cycle. For custom optics packaging requirements or questions about the best available choice among our existing optics packaging solutions, use our easy help and contact tools for quick response. 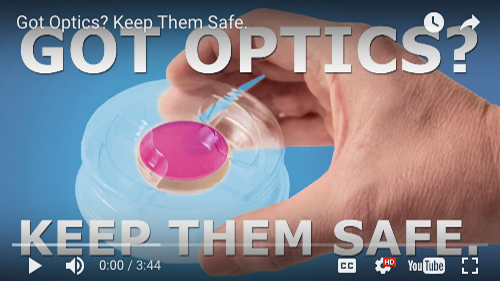 Safe-Guard designs and manufactures thermoformed PET-G optics packaging containers for the full range of today's optical lenses, filters, and mirrors. Our unique, slip-fit, low outgassing optics containers are the industry standard for value and performance. Designed to contact optics on only the bevels, these versatile containers eliminate the need for lens paper and foam liners, and greatly reduce the opportunity for handling-generated surface degradation. Made from low outgassing, NASA-tested, and Eastman Chemical-developed PET-G material. Sensitive optic surfaces never come in contact with packaging - optics are suspended by bevels only, while outer packaging provides superior protection during shipping and handling. Unlike conventional packaging, Safe-Guard Optics Packaging Containers are suitable for use under the most rigorous clean room standards. Stack easily for handling, storage, shipping, and in-plant processes. Superior crush protection because it is made from a flexible material for shock and impact absorption, and protects optics during all phases of manufacturing. Holds optics on the bevels only, while allowing for easy loading and removal. Made from low outgassing, translucent PET-G which allows for quick visual contents checks and is also suitable for use under the most rigorous clean room standards. Used by leading optical manufacturers for over 25 years. Enhanced value: Your products look and present better. Dedication: Demonstrates your commitment to provide the best optical elements and service. State-of-the-art: Recognized as the best optics packaging system available. Versatile: Standard optics containers are adjustable through a wide variety of sizes. Cost-effective: Improved packaging pays immediate loss-reduction dividends. Whether you use one of the many stock optics container sizes that are already available, or you require a custom package, Safe-Guard is ready to meet your optics packaging needs!